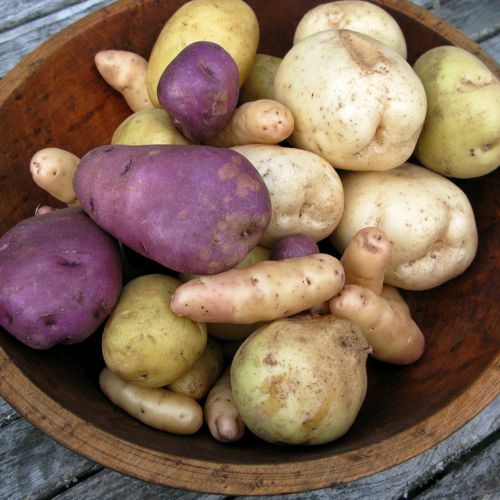 There are several advantages to growing potatoes in containers rather than in the ground. Chief among them is that it's easier to protect the plants from the critters that love to eat them. Plus, you don't have to find extra space in the garden or worry too much about weeds. Container potatoes are also a really fun project to do with kids. The plants grow amazingly fast and produce a great yield for the space required. Besides, most kids enjoy eating potatoes anyway, and they'll love the ones they grow themselves even more. The only real disadvantage to growing potatoes in containers is that you have to be more vigilant about watering. It is very important to keep your soil moist: not wet, but damp. If you check the soil moisture often and water deeply, you should have a great potato harvest. You can grow potatoes from "seed" potatoes. These potatoes have not been sprayed to stop their seeds from sprouting, so they're ready for new growth. Seed potatoes are available from nurseries or specialty, organic growers such as Wood Prairie Farm, which has a great selection of interesting varieties. You can also grow potatoes from organic potatoes from the store. These should not have been sprayed and you simply need to let them sprout in a cool, dark place. It is possible to grow potatoes in any large container, from large pots or nursery containers to big garbage cans. Even trash bags or stacks of tires will do, though you have to be cautious about these because they can get very hot in the sun. Also, the jury is still out on the potential toxicity of some plastics and rubber, which might leach into the soil as the material breaks down. Another great option is to plant potatoes in a "potato condo." It is a homemade box created with wood planks that you build up as the plants grow and you add more soil. This is an inexpensive vertical gardening technique that will maximize your potato yield and can be done in a very small space. Whatever you use for a container, make sure it has good drainage. If it doesn’t come with drainage, make sure to add some by creating holes in the bottom. Smart Pots are a fantastic option for potatoes as well. These growing containers are lightweight, environmentally friendly, and made of fabric, so your potatoes get air as they grow. They also have great natural drainage, ensuring your potatoes will never sit in water and rot. Use a high-quality potting soil that is fast draining, especially if you're using a plastic container. Organic soils are always a good choice as well. If you are using a Smart Pot, you can use a garden soil mixed with compost. Mix an organic, slow-release fertilizer into the potting soil when planting your potatoes. As the potatoes grow, it is a good idea to use a diluted liquid fertilizer like fish emulsion every couple of weeks. Potatoes will not grow without sun and water. Place your container where it will receive at least six to eight hours of sun a day. Your potatoes also need consistent water and you will need to be observant about maintaining a perfect balance. You want to keep the soil moist, but not wet. If the soil is too dry, the plants will die; if it’s too wet, the potatoes will rot. If the moisture level is inconsistent, your spuds will be misshapen. The nice thing about containers is that you can visibly see when you've watered deeply enough. Simply watch for water to seep out of the container's bottom and you'll know that they have a sufficient amount of water. Now that you have all your supplies, it's time to plant your potatoes. Fill your container with at least 4 to 6 inches of potting soil. If your soil doesn’t include a fertilizer, mix in a slow-release fertilizer according to the directions on the box. One of the advantages of using an organic fertilizer is that it's much more forgiving if you accidentally pour too much. If you use too much conventional fertilizer, it can easily burn your plants. There are a few theories on preparing potatoes for planting and one is not necessarily better than any other. Some people wait for their potatoes to sprout and some people just plant them. Then there are those who cut their potatoes and let them "callus over" by leaving them to sit for a couple of days. Others will cut the potatoes right before planting. If your potatoes are small, you don't have to cut them at all and can simply plant them as-is. When you cut your potatoes, make sure that you have at least two eyes on each piece. It's also recommended that each piece be at least 2 ounces. Most people have no idea how large 2 ounces is and there's no need to weigh it; just use your best guess. The plants will grow fairly large, so make sure to give them some breathing room. For example, a container that is around 20 inches wide can handle about four small potatoes. It may not seem like much when you're planting, but the size of your potato harvest will surprise you. After you have planted your seed potatoes, cover them with a couple of inches of soil and compost. Don’t get too enthusiastic here because you don’t want to plant them too deep. One to 4 inches is perfect and the cooler the climate, the less soil you should put on top. Water your newly planted potatoes well. Remember that one of the keys to growing potatoes is keeping your soil moist, not wet. This cannot be stressed enough. Check the container at least once a day. To check the moisture level, stick your finger at least an inch into the soil (or up to your second knuckle). If it feels dry, it's time to water. If it’s very hot or windy, you may have to water your potato container gardens more than once a day. Make sure to water deeply by waiting until water runs out the bottom. It is counterproductive to just water the surface of the soil. Once your potato plants have grown about 6 inches, you need to "hill" them. This is done by adding a couple of inches of a soil and compost mix around your potato plants. Be careful not to break the plants in the process. You will be covering some of the leaves of the plants as well. The goal is to leave at least two-thirds of the plant (with its leaves) sticking out of the soil. Repeat the hilling process a few more times as your plants grow. You can also stop once the soil reaches the top of your container. Potato plants grow incredibly fast, so keep an eye on them and don't let them get ahead of you. You can begin to harvest potatoes anytime after the plants have flowered. Carefully reach down into the soil of your container and pull out a few potatoes at a time. You can also wait until the plants turn yellow and die back and then harvest all of the potatoes at once. The easiest way to do this is to turn the container over, dumping it into a wheelbarrow or onto a tarp. You can then freely paw through the soil to find all of the potatoes. You may find a few really tiny potatoes, but don't chuck them. Those can be some of the best and sweetest potatoes of the year and they're perfect for tossing whole into a stew. Cook your potatoes right away or store them for later use. For storage, begin by brushing off the dirt then let them dry for a couple days. They're best stored in baskets or paper bags that allow them to breathe.